I remember the first time I looked through my very own thesaurus. I cracked open the spine and placed the bible of words on my lap, eager to flip page after page to discover long words, elegant words, new words, unpronounceable words—the possibility of words was endless. But was it too much power? 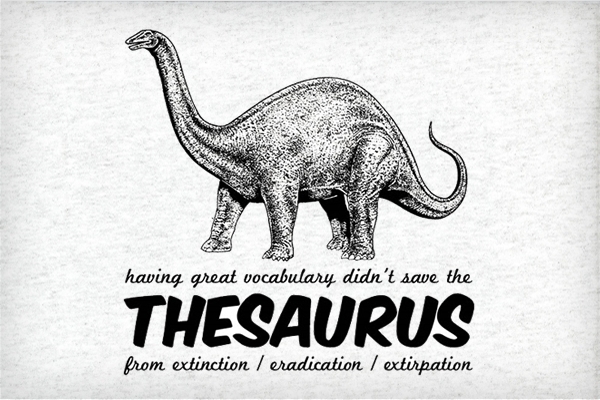 We like to think that the thesaurus helps us, but oftentimes it holds us back from our real writing potential. Writers don’t agree on this issue. Some claim it to be the ultimate writing tool, while other writers curse the thesaurus for its flaws. So, which is it? Is the thesaurus really our friend—or our enemy? If you need to pull a word from a thesaurus, chances are it’s the wrong word. Changing a sentence from “she ran to the store” to “she cantered to the store” also changes the meaning of the sentence. We often turn to a thesaurus to find a smarter-sounding word to use in our writing. But it’s just as often the word that is ill-placed or stands out awkwardly in the sentence. It’s hard to start writing again once you stop. Your time is better spent writing the word “run” in your sentence, then continue writing and edit the sentence later. There’s a chance that “run” was the right word all along. The thesaurus can be a great tool for those tip-of-the-tongue times. You close the thesaurus. You continue writing. Use the thesaurus as a brief reference for those what’s-that-word moments. But don’t let the insecurity of the wrong word consume your time and your confidence. Because a real friend wouldn’t let you doubt yourself. Is the thesaurus your friend? Share your opinion below. I use the thesaurus when editing. Not just for in a paragraph to help avoid repetition (using ‘run’ three times in the same paragraph) but also as a way to figure out if the words I’m using actually mean what I think they do.